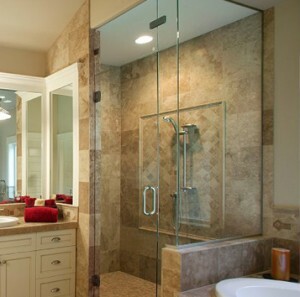 Lemon Bay Glass (LBG) specializes in sales, measurement, and installation of custom shower doors. From start to finish, we are with you every step of the way. Read on for various information that will assist in designing your next project. The following are some basic steps in completing your project. LBG works closely with contractors, builders, architects, designers and homeowners during the initial planning stages. Link here for full description of the LBG process. The home has long been seen as a sanctuary, a place to relax and recover from the pressures of daily life. And, with the recent economic crisis and today’s fast-paced world, people are looking to de-stress in any way possible. Follow this link to read more on options to easily make updates to the home bath. There is a variety of shower finishes from which to choose. We aim to stay in front of the current design trends and stock many of these materials on site. Note some finishes may need to be custom ordered and some may go out of stock without notice. We will work to meet your design guidelines and budget requirements. Link here for LBG shower finishes. There is a variety of glass available for customizing your design. Note some glass may need to be custom ordered (delivery and times based on origin) and some glass may go out of stock without notice. We will work to meet your design guidelines and budget requirements. Link here for LBG patterned glass diagram. The following are some cleaning techniques for maintaining the beauty of your LBG installed shower enclosure. Your bathroom has now become your favorite room in the home. It has been transformed into the perfect home spa! The beautiful new glass shower enclosure is now a main focal point of the room and is essential in providing relaxation and an atmosphere of luxury. 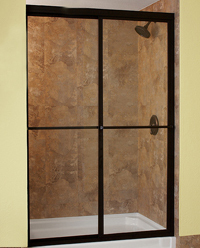 For neat and clean shower doors you need to simply squeegee the glass after each use. Wiping down the interior of the shower will prevent a musty odor and by using the squeegee it will eliminate the water spots that appear on the glass once your shower is complete. Never use harsh chemicals or abrasives on your metal frame or glass. Link here for LBG shower care. Link here for brochure on Choosing Windows and Doors. Link here for brochure on caring for and maintaining your windows.